:In one extraordinary day, Jesus performed two of his most famous miracles: the feeding of five thousand with only a few fish and loaves of bread, and walking on the water of Galilee during a storm to reach his frightened disciples. Beautiful artwork and simple text make this book a standout, and perfect for our 2- to 5-year-old target audience. 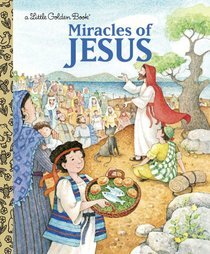 About "Miracles of Jesus (Little Golden Book Series)"
Jane Werner Watson wrote and edited many children's books from 1944-1978 and has published under at least three different variations of her name: Elsa Jane Werner, Jane Werner, and Jane Werner Watson. Many of these were for Golden Books, including at least 35 Little Golden Books, and many more were for Walt Disney Productions. Some are religious in theme, some silly or comic, and some truly magical.